I love to have that T-shirt, but donâ€™t you think it will cost me cash advance, since itâ€™s quite expensive. 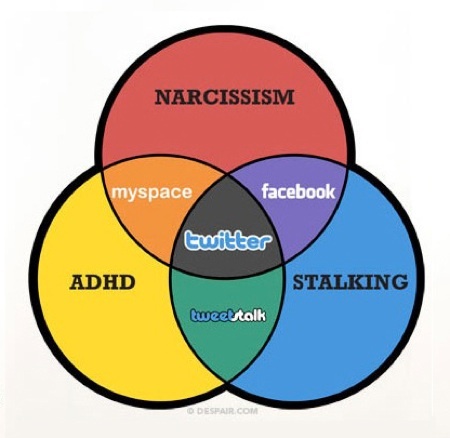 But anyway, I find this Venn Diagram of Social Media really true. Well as you can see nowadays we are more indulge in FACEBOOK, MYSPACE, TWITTER that results to in correlate with egoism as what is stated there. Hmmm, Facebook is not the only site for stalking but Myspace also. I chuckled when I saw this here. I bought that t-shirt a couple of months ago! #1 is more sophisticated blogspam than average — it seems to have been produced by an actual human being who actually looked at your diagram and found something (albeit something with rather little content) to say about it.